Living in Chicago has its perks, one of which is the ability to enjoy a delicious beverage while getting beautified. Beauty bars, salons, and stores with a retail food or liquor license can sell liquid refreshments to accompany their services. Did you know that you can also BYOB to over 60 places (not including restaurants) without a liquor license in Chicago? You may have thought that BYOB establishments acquire a special license (as they do in other states), but in Illinois, the Liquor Control Act allows each municipality to determine whether businesses may accept BYOB customers. According to our research, Chicago has no municipal code or ordinance regulating BYOB practices - meaning any business (such as salons) can allow patrons to bring their own beverages as long as having alcohol on premise doesn’t contradict state license restrictions. Businesses with a liquor license can store, serve and handle alcohol. Because most BYOB salons don’t have a liquor license, don’t expect them to hold onto an unfinished bottle or refill your cup after the bottle is opened. BYOB regulation has been a hot topic in the past, so to keep this flexibility it’s important that patrons drink responsibly. Yamato in River North is by far the best place in the city to get a foot massage. If you’ve never had your calves beaten with a rubber mallet, grab a complimentary green tea or purchase a cocktail (or non-alcoholic bevv) at Yamato and prepare for greatness. 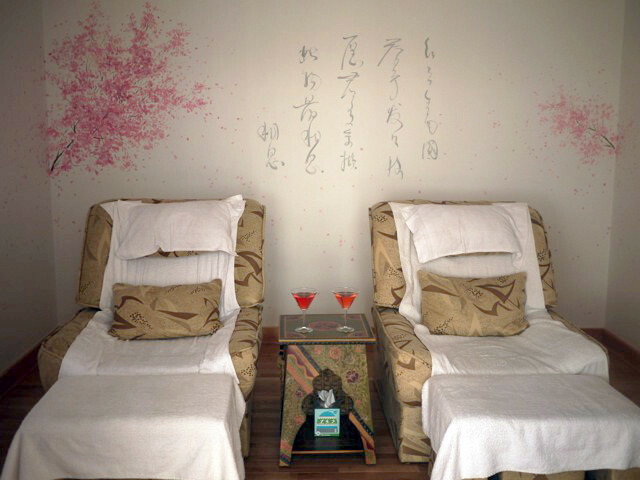 Services include reflexology, hot stone, and gastric treatments. Beauty Bar is a full service bar where nightly manicures are part of the service. From 7pm - about midnight, try a signature cocktail or mocktail and get a polish change for $10 Sunday through Thursday and $15 Friday and Saturday. Large groups (15+) can make reservations before 9pm, otherwise manis are walk-in only because things get busy with all of the music and dancing at this River West hot spot. Business owner Amanda, aka the Willy Wonka of Beauty, has a full line of skincare and makeup products to shop for at Mojo Spa. The store also has a nail salon where you can try out some of her signature products. Bring your own drinks, host a bachelorette party, or attend an upcoming Beauty Brunch or upside down tea party event. Polish and Pour is a boozy nail salon with locations in both Old Town and Streeterville. Have your own venue (or want to stay home)? You furnish the bevvs, and Stylisted can connect you with the service you want. Stylisted searches available stylists in your area who can provide hair and makeup services at reasonable salon prices. Currently in Chicago, New York, Los Angeles, and Washington D.C.